A record 100 luxury-vehicle dealerships representing nine brands are on this year's Ward's 500, 19 more than last year, confirming the growth of the premium automotive segment. There was a time nearly 20 years ago when industry experts were skeptical of auto maker attempts to launch new luxury brands During the late 1980s, one of the hot topics of conversation centered on the wisdom of Japanese auto makers launching upscale brands such as Lexus, Acura and Infiniti in the U.S. market. In fact, Auto Age magazine (which later became Ward's Dealer Business) in November of 1987 ran a story debating the upmarket move. Many analysts and dealers questioned whether the U.S. could digest the introduction of the new brands. Meanwhile, it was a tough time for many dealers, and asking them to invest in new facilities, especially upscale ones, was thought to be foolhardy. In the story, one Honda dealer branded as “folly” Nissan North America Inc.'s decision to launch Infiniti and Toyota Motor North America Inc.'s decision to start Lexus. Other dealers, though, such as David Wilson in Southern California, accurately predicted Toyota's strategy would work because of the success of its dealer body. Wilson's Tustin Lexus store is 91st on this year's Ward's 500 with $158 million in total revenue. Wilson back then was leery about Nissan's Infiniti plan, mainly because the dealer body had had such a tough time during the 1980s. But Infiniti sold 136,401 units in 2005, a 4.1% increase over the previous year. The luxury market now is hot and one of the fastest-growing parts of the business. Ward's expects the share for luxury brands to top 11% for entire 2006. Right now the share is 10.8% but luxury share tends to rise in the second half of the year after the spring selling season, which in terms of share, tends to favor more mainstream vehicles. “The demographics for this business are absolutely fantastic,” says Michael Jackson CEO of AutoNation Inc., the nation's largest dealership chain. He says much of the segment's growth comes from Baby Boomers treating themselves to premium vehicles as they continue to flex their financial muscle. Jackson predicts the premium luxury market will be a fast-growing segment in the next five to 10 years, pointing to vehicles such as Mercedes-Benz' new S Class and Lexus' LS 460, both launched this year. The 100 luxury stores on this year's Ward's 500 generated nearly $13.5 billion in revenue in 2005, averaging about $131.6 million in total sales. There are 14 non-luxury brands (including those classified as multi-brands) accounting for the other 400 dealerships. Those stores averaged about $122.5 million in total revenue. As a group, the Ward's 500 set a record for total sales in 2005, with revenues of nearly $62.6 billion. Every profit center posted increases, with new-car departments generating nearly an average of $3 million more than in 2004. Lexus has become a premier franchise to possess, if not the premier franchise. The brand sold a total of 302,895 units in 2005, an increase of 5.2% over 2004. Of its 174 U.S. dealerships, 32 are on this year's Ward's 500 list, with an average total revenue of $132.7 million (see chart on p. 16), behind only Mercedes-Benz stores and dealerships selling multi-brands in average revenue. Infiniti and Honda's Acura Div., produced more modest results, accounting for only six dealerships on the 500 list this year. Honda executives envisioned 600 Acura dealerships when it launched the luxury brand in the 1980s. The brand, though, currently has approximately 200 dealerships, while Infiniti has about 130 stores. Still, luxury stores, including those selling European vehicles, have increased their numbers significantly on the ranking. Of AutoNation's 107 dealerships on the Ward's 500 ranking this year, 27 are luxury stores that generated $3.7 billion of the company's $18 billion revenue in 2005. Since Jackson (the former president of Mercedes-Benz USA) joined AutoNation in 1999, the company's emphasis on the luxury segment has intensified to where 22% of its revenue in the first quarter of this year came from luxury sales, double what it was in 2000. Luxury sales in the first quarter were up 15% for the auto maker. AutoNation has increased its luxury brand presence from 40% of its portfolio to 60% since 2000. United Auto Group reports similar numbers from its luxury business, with a 15.8% revenue growth at its premium brand dealerships, many of them premium European brands. 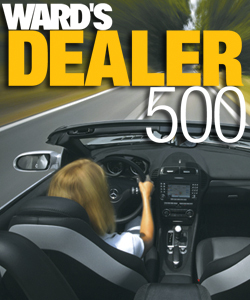 Seven of UAG's 24 dealerships on this year's Ward's 500 list are luxury brands. While Lexus gets much of the attention and is considered to be the luxury franchise to have, the 26 Mercedes dealerships on this year's Ward's 500 averaged the most in total revenue of any brand. It has been that way since 1999. Mercedes' average revenue this year, $162 million is a record, and is $20 million more than the second place multi-brand stores and $23 million more than Lexus's average. Morton Zetlin, owner of the 56th ranked American Service Center, a Mercedes dealership in Virginia, says the brand has been strong for years because of its strong products. (See story on p. 34). Although the brand has been quality issues in recent years, many dealers consider Mercedes the brand to have. Publicly owned dealerships have bought some high-profile Mercedes stores recently. Sonic Automotive Group last year acquired the 54th-ranked W.I. Simonson Mercedes Benz dealership in Santa Monica, CA. AutoNation is buying Autohaus Mercedes Benz in Pompano Beach, FL, and intends to build a new Mercedes store in Pam Beach, FL. That would give AutoNation seven Mercedes franchises. “We are looking to add more of them,” says AutoNation President Mike Maroone. Stan Rodia, service director for American Service Center, say Mercedes quality issues are less of a story today than they were a couple of years ago. With 25 of its 215 dealerships on this year's list (the same as last year), BMW is another solid luxury brand. The average revenue per store, however, is down slightly, from $119.8 million in 2004 to $117.8 million in 2005. Average BMW new-unit sales on the Ward's 500 were down 997 units (although overall U.S. sales were up 3.7%). In 2005, UAG's 31 BMW/Mini dealerships generated 15%, or $1.5 billion of its total revenue. The group added to its BMW total this spring, acquiring Motorwerks BMW/Mini in Bloomington, MN. Interestingly, General Motors Corp.'s Chevrolet brand's dealerships on the Ward's 500 have a higher average of total revenue than do BMW stores by almost $10 million. Chevrolet, though, saw its dealership totals on the Ward's 500 drop from 79 last year to 58 this year. Likewise, Ford dealerships declined to 67 — down from 87 last year and 138 in 2000. European and Japanese premium brands mainly are driving the luxury segment's strong showing on the Ward's 500. General Motors Corp.'s Cadillac division, with five dealerships on this year's list, averaged $132.2 million, down from $150.2 million in 2004. Cadillac dealerships sold an average of 319 fewer new vehicles, yet posted an average $16 million decline in new car revenue. Average revenue per new car sale dropped nearly $1,500 to $39,000. While luxury brands are posting impressive numbers on the e Ward's 500 ranking, non-luxury brands remain healthy. Interestingly, GM's Chevrolet brand's dealerships on the Ward's 500 have a higher average of total revenue than do BMW stores by almost $10 million. The average Ford store on the Ward's 500 sold 180 fewer vehicles than in 2004, yet average total revenue stayed almost the same, down only $12,000 to $10.5 million. While average new-car revenue declined $1.8 million with 180 fewer average units sold, the Ford dealerships on the list showed an ability to adapt, posting slight gains in the other departments, led by parts and accessory sales that increased $1 million. Chrysler-Jeep-Dodge stores on the ranking increased from seven in 2004 to 12 in 2005, while average revenue per store declined $2.8 million for an average of $111.7 million. Japanese non-luxury brands significantly increased their dealership totals on the Ward's 500. Toyota added 15, Honda, 11. Moreover, Honda's average total revenue went up nearly $6 million on the strength of increased sales revenue in both new- and used-car departments. Honda averaged seven more new-car sales than in 2004, yet increased its new-car revenue $3.2 million, an indication of increased vehicle value and more upscale product offering. Honda, though, still lags behind brands such as Ford, Chevrolet and Chrysler- Dodge-Jeep brands in average revenue. Toyota's average total revenue also increased, going up almost $5 million, with higher average revenue in each department, led by its new-car sales, which was $1.3 million more than in 2004.